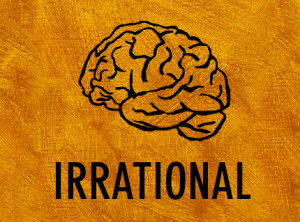 Irrationality is often negatively viewed in modern society, but in actuality irrational behavior has many benefits. For starters being irrational allows you to become more self-confident in the decisions that you make, for acting without rational shows a lack of concern for what others think or say about you, your actions, thoughts, or opinions. All too often in life, we alter what we say and do to fit the conformist molds that society places in our lives, in other words we bend ourselves into a human pretzel. While many allow what is deemed acceptable and unacceptable to be determined by others, those who truly live the best lives throw caution to the wind, and say and do what they want, when they want. In life, often times we do not reveal our full opinions for fear of upsetting others or causing conflict but acting irrationally allows us to express our true feelings. This brings about a feeling of freedom because when you do not hold anything back, it provides the perfect opportunity for you to lay your heart out on the line, and show everyone what you truly think and feel. And who doesn’t like the feeling of being free?! This action opens the door for other positive changes in your life. In one specific example, you may say something about how you feel that upsets a friend you have, and as a result, your friendship experiences a kink. Instead of viewing this as a negative thing, consider it a positive one and take confidence in the fact that you now have the chance to make other friends who share the same thoughts and opinions as you and that same friendship just might evolve into the kind of relationship you’ve been wanting. Truly, the benefits of acting irrational are endless, but it is important to remember that there are limits, and I’m sure you know what these kind of limits are. So remember to use common sense when acting irrational (yes, I know that sounds conflicting). Either way, not holding back and allowing yourself to be irrational can open up a whole new world of possibilities for you. In fact, it just might be the most rational thing you’ll ever do.